After those embarrassing reports about his travel expenses, Health and Human Services Secretary Tom Price is exiting the Trump administration. "Secretary of Health and Human Services Thomas Price offered his resignation earlier today and the President accepted"
Price was outed this week as having used private jets for travel at taxpayers' expense. 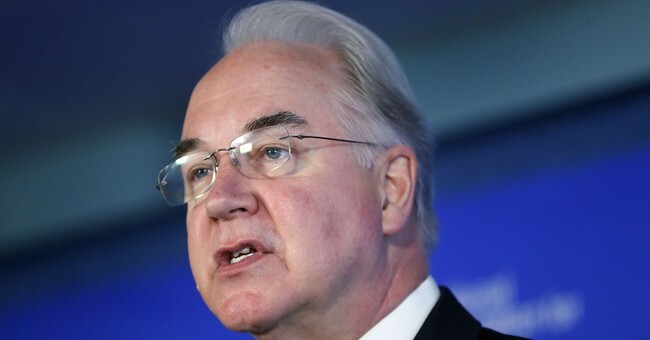 As Politico reported, the non-commercial flights the HHS Secretary took amounted to the tune of tens of thousands of dollars. One of the most head scratching itineraries he booked was the $25,000 flight he took from Philadelphia to Dulles. As penance, Price offered to "write a personal check to the U.S. Treasury" for his expenses and he promised to no longer take private charter flights. Those pledges were apparently not enough to regain the president's trust. Before Price's resignation, President Trump refused to say whether or not he still had confidence in Price. He did, however, say Price was a "good man." Other Trump officials like EPA Administrator Scott Pruitt have watched their travel plans be scrutinized by the media as well. However, Guy explained how Pruitt's travel doesn't compare to Price's questionable and pricey flights. President Trump will designate Don J. Wright of Virginia as acting secretary until a permanent replacement is found.